If that’s the case, you have to ask yourself, is getting a great body all there is to exercising? How Can Exercise Help Lower High Blood Pressure? 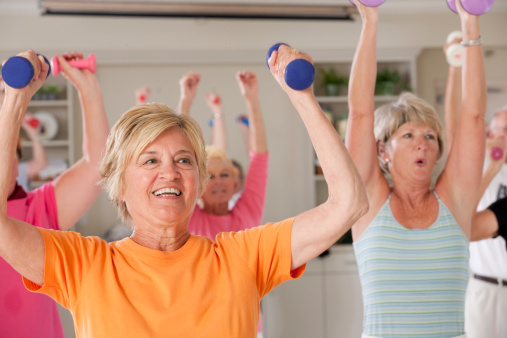 What Types of Exercise Can Lower Blood Pressure? The Pennington Biomedical Research Center recently conducted a study on 400 women between the ages 45 to 75 who were all overweight, obese, and had high blood pressure. They divided the women into four groups; three of the groups exercised at different intensity levels. These types of exercises will get your heart pumping at a good rate; they can even include fun activities, like jogging around the block, jump rope, riding a bicycle, or walking around the mall. (Believe it or not, there are many free, nationwide mall-walking clubs—it’s also a great way to meet new people.) The average amount of exercise you should do each week is at least two-and-a-half hours. By lifting weights, you’re building strong muscles that will help your body burn more calories throughout the day, which will help lower your blood pressure. It also strengthens your joints and bones as well. This type of exercise can be dangerous if not done properly, so consult with your doctor and/or a fitness professional before embarking on it yourself. Before you do any type of exercise, it is important to stretch your muscles and joints. It will make you more flexible and increase your balance as well. More importantly, it will prevent you from getting injured; you can’t exercise if you’re hurt. It also helps to stretch after exercising. You don’t want to overdo it too much, so when doing a moderate activity such as walking, you should aim for at least 30 minutes a day, five times a week. If you have a busy schedule, you can get away with exercising for 20 minutes a day, about three to four times a week. If you’re not someone who works out often, it would be a good idea to ease into your routine; start off slow and gradually build up your endurance. Start by taking five to 10 minutes to warm up and stretch to get your blood flowing. After you have warmed up, it’s time to figure out what your intensity level should be. Generally, you should be able to carry on a conversation while you are exercising—this is usually a good way to gage the appropriate intensity level. The last part of the exercise is the cooling down phase. You don’t want to just suddenly stop; you want to gradually slow down, especially if your blood pressure is very high. Pick a time and exercise at that same time every day. Eventually, it will become a regular part of your daily routine without you even realizing it. Dress accordingly. If you’re uncomfortable, you’re more likely to skip exercising. If you’re exercising outdoors, make sure you dress for the weather, not to impress. Wear layers that you can easily take off as you gradually begin to sweat. Take your blood pressure before and after you exercise; it could be high before you work out, but when you are done exercising, it will be considerably lower. Nothing boosts motivation like results and success. You should always set realistic goals for yourself. For instance, if you are doing strength training, don’t set a weight you know you won’t be able to lift—nothing kills motivation like failure. The only way exercising is going to work for you is if you value your health. A lot of people don’t think that having high blood pressure is a big deal and they tend to ignore it. That is when heart disease kicks in—but by that time, it could be too late. No more excuses! Once you begin the journey to lowering your blood pressure, you need to stick with it. This is your health that we’re talking about here; at the end of the day, no one is going to take care of you better than yourself. Cunha, J.P., “High Blood Pressure Hypertension,” MedicineNet web site; http://www.medicinenet.com/high_blood_pressure_hypertension/page5.htm, last accessed May 6, 2015. “Exercise Tips for Those With High Blood Pressure,” WebMD web site; http://www.webmd.com/hypertension-high-blood-pressure/safe-exercise-tips, last accessed May 6, 2015. Orenstein, B.W., “The Best Exercise for Hypertension: A Little Goes a Long Way,” Everyday Health web site, April 18, 2012; http://www.everydayhealth.com/hypertension/the-best-exercise-for-hypertension-a-little-goes-a-long-way.aspx.